Warranty Registration - Thank you for choosing HP Calculator. Please register your calculator by filling in the information below. Keep me in the loop on HP Calculator. 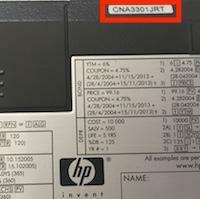 The serial number is found on the back of your HP Calculator. It should read read like CNA12345678 or PHA12345XZ. To acknowledge the receipt of your registration, we will send an e-mail confirmation to the address you have provided. Some spam filter may prevent our replies from reaching you. If you do not receive your e-mail confirmation with a few hours, please check your spam message box. All HP Calculators are covered by a one-year limited warranty against defects in materials and workmanship. HP warrants all products against defects in materials and workmanship for a period of one (1) year from the date of original consumer purchase. If a defect exists during the warranty period, HP at its option will either repair (using new or remanufactured parts) or replace (with a new or remanufactured unit) the product at no charge. The warranty will not apply to the product if it has been damaged by misuse, alteration, accident, improper handling or operation, or if unauthorized repairs are attempted or made. Some examples of damages not covered by warranty include, but are not limited to, battery leakage, bending, or visible cracking of the lcd, which are presumed to be damages resulting from misuse or abuse.